$36.75* San Bruno Smog Check Coupon - The Smog Shop San Bruno - 965 San Mateo Ave, San Bruno, CA. Phone: (650) 254-8317. Local San Bruno Smog Station. Just 3 friends, with a passion for cars, who enjoy helping out the community we grew up in. The Smog Shop San Bruno specializes in emission testing. No repairs, no upsells. Just straight forward and accurate smog inspections at pricing that's fair and honest. We know that smog checks can be very time consuming and take away from more important things in your day so we're dedicated to delivering fast and friendly service to get you on your way. 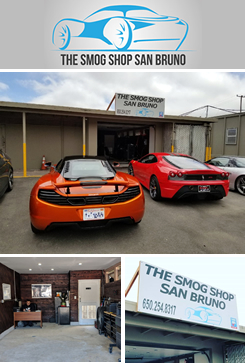 Why visit The Smog Shop San Bruno? Shop Hours: MON-FRI 9:00am to 5:30pm. SAT 9:00am to 4:00pm. Closed on Sundays. Conveniently located off I-380 on the Peninsula between San Francisco and San Jose. Smog Special: ONLY $36.75*. See details. *Applies to 2000 & newer vehicles. + $8.25 CA smog certificate fee. More certified smog station near San Bruno, CA.